Should you disregard or include ex-customers in your marketing plans? Customers don’t exist – the customer company doesn’t exist for various reasons. Customers not using – customers that don’t use your product/service/solution. Why should you pay attention to, and spend marketing resources on ex-customers? Because, firstly you can learn valuable insights and secondly there is potential revenue from your ex-customers. Most companies tend to disregard ex-customers because they view them as a lost cause and it’s too unpleasant or difficult to communicate or deal with ex-customers. But they’re missing out on a significant opportunity to improve their business by learning from ex-customers. And there is still potential revenue to harvest. Customers that no longer exist – nothing you can do about customer companies that shut down, go out of business, merge, get acquired or cease to exist for whatever reason. However, there were people inside those companies that used your product, maybe even liked your product. These people have moved on to other companies, they know about your product/service/solution, you probably have their names in your database. Find out where they are now and reconnect. Someone with a positive previous experience with your product/service/solution can be a valuable contact to market and sell into the company where they currently work. Customers that have stopped using your product/service/solution – this can happen for a variety of reasons including dissatisfaction, new management preferences, a competitive product/service/solution that better meets their needs or many other reasons. Losing customers is painful and costly and has a direct impact on Lifetime Customer Value (LCV). The customers you have lost can provide valuable insights to prevent losing more customers by applying those lessons for improving or correcting whatever caused them to defect. Proactively taking action based on empirical research and analysis from these ex-customers can greatly improve retention and loyalty for current customers. The first step is to categorize the reason for defection – let the information from ex-customers guide you to the right categories rather than preconceived internal opinions. Identify the underlying causes in the ex-customers’ context, that led to the defection. Look for commonalities and trends to determine appropriate corrective action to avoid or minimize future defections. Get information about when they stopped using your product, what they’re using now, whether they’ll make the same decision again, etc. Determine what other useful and relevant information to gather for the Customer Defection Analysis based on your specific business/ product/service/solution circumstances. Can you provide paid services to help them migrate from your system to their replacement system? I know this sticks in one’s craw, but getting someone from your company into the ex-customer environment to provide services can yield significant insights in addition to the services revenues. Can you sell them something that is either complementary to their new system or addresses a completely different functional area of the business? Put them on the contact list for appropriate marketing programs to stay in touch and consider your business/product/service/solution for future needs. Although gathering information from ex-customers may seem difficult, most people are usually willing to share the reasons for the decisions. Don’t be defensive, argumentative, judgmental or try to rectify the past – just listen and learn. Being understanding, supportive and helpful during this information gathering process can put your business in a more favorable position for possible business opportunities with ex-customers. Are you currently disregarding or including ex-customers in your marketing plans? Has this article given you food for thought to reconsider your practices in this area? Your comments are always welcome. Continuing the series of posts about Lifetime Customer Value (LCV), this post looks at how Customer Retention impacts LCV. Everyone probably agrees that customer retention is important and we know intuitively that better retention is a good thing. But just having better customer retention isn’t worth much unless you have relevant programs to monetize existing customers. Do you know specifically how a change in customer retention will manifest in financial terms at your company? Assuming the same sales penetration rate for existing customers, revenues and gross profit would increase by 41% and 34% respectively during years 2-5 (the retention period). The LCV revenue and profit per customer would increase by 9.1% and 9.3% respectively over the full 5 year lifetime period. In this example the 10% increase in retention cost represents 1.05% of total costs. Therefore an investment of 1.05% returns 9.3% additional LCV profit – a good deal by any measure. Would you like to do this for your company? Unless you have factual LCV baseline data to model possible improvement scenarios, you’re just guessing that the outcome would be favorable. In this example, spending 28% more on customer retention produces a negative return – do you know what your rate of return would be for various spending levels? What’s the value proposition for customers to stay with you longer than they have been? How much can you spend to retain more customers? If you can retain more customers, how are you going to monetize it? There’s no point in just retaining more customers if you don’t have a plan to market and sell something to them. What other benefits can you reap from retaining more customers? For example, a larger pool of candidates for references and case studies. Hopefully this series of blog posts has provided some ideas and food for thought to make better decisions and improve business results using Lifetime Customer Value data. Last week’s post looked at the calculations and mechanics of developing a Lifetime Customer Value (LCV) model. This post reviews some of the insights that can be determined from LCV calculations for better marketing, sales and business decisions. Consider the following sample analysis using the same LCV model example from last week's post for reference. 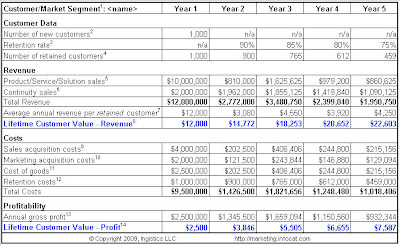 Acquisition costs for a new customer are high and profitability in the first year is usually low or possibly negative. In the example, the ROI in the first year of acquiring a new customer is ~26% whereas the ROI for the next 4 years for those same existing customers is ~92%. More remarkable is the Sales & Marketing ROI in the acquisition year is ~42% and ~297% over the next 4 years. While this insight may be intuitively obvious in general, it is knowing exactly what your numbers are that will enable you make informed strategic decisions for improving performance. Consider LCV per customer – in the example, total revenue over 5 years is $88,279 of which $12,000 (13.6%) is realized in the first year. LCV per customer in profit terms is $26,093 over 5 years of which $2,500 (9.6%) is realized in the first year. The point here is that many B2B companies invest a huge amount of resources, time and effort to acquire new customers, but rarely seem to show that same determination and enthusiasm for generating returns from existing customers in subsequent years. But the vast majority of the revenue potential and profitability is only realized in those subsequent years. Are your marketing and sales resources aligned with generating the maximum lifetime value from your customers relative to your specific LCV data? Are these resources appropriate relative to the lifetime values? The type of marketing campaign and sales activity to acquire a new customer is quite different from marketing and selling to existing customers. Knowing your LCV revenue and profit profiles, are you using the right marketing and sales channels? In last week’s post I recommended calculating LCV by customer or market segment. You may also consider a separate dimension by product line if applicable. Having the market segment and/or product line slices of the LCV data provides more granular and specific insight for making even better and more relevant strategic decisions. Customer retention is a significant factor in determining Lifetime Customer Value revenues and profitability – I’ll explore that in the next post. I’ve mentioned Lifetime Customer Value (LCV) in several previous posts. Subsequent discussions around the topic of LCV indicated that while many people talk about it, few actually know the information for their business. Seems that there are perceptions about lack of data, complexity, calculation formula, etc. that get in the way of determining LCV. There’s tremendous value in going through the process and determining LCV for your business. Keep it simple to start, then refine and improve data and calculations over time. Unless you only sell one type of product/service/solution to one market segment, you should do LCV calculations by customer or market segment – this will provide much better information and insights to make good strategic decisions. LCV information averaged over all customers in a multi-segment business tends to obscure the nuggets that can make a huge difference. The number of new customers in that customer or market segment acquired in a recent year. What percentage remain active customers in each subsequent year (year over year %). Calculated from the initial number of new customers and subsequent retention rates. Total product/service/solution revenues from these customers each year. Year 1 is when they initially buy, subsequent years are additional purchases. If applicable, the annual license/maintenance/service/support/hosting/etc. fees the retained customers pay. Divide total annual revenue by number of retained customers for each year. Cumulative total revenue divided by initial number of customers. This reflects the LCV in Revenue terms for each customer. In this example each of the initial 1,000 customers that produce $12,000 in revenue in year 1 from the initial sale, produce $18,253 in revenue over 3 years and $22,603 over 5 years. Your total sales costs for acquiring the customers in year 1 and additional purchases in subsequent years. Your total marketing costs for acquiring the customers in year 1 and additional purchases in subsequent years. Your cost of goods sold (COGS) – this example uses a 25% of revenue flat rate. The costs for retaining customers and generating continuity sales(6) – such as support, product updates, services, etc. Total revenue minus total costs. Cumulative gross profit divided by initial number of customers. This reflects the LCV in Profitability terms for each customer. In this example each of the initial 1,000 customers that produce $2,500 in gross profit in year 1 from the initial sale, produce $5,505 in gross profit over 3 years and $7,587 over 5 years. For added financial accuracy, the Revenue and Profit LCV over the extended period should be calculated in Net Present Value (NPV) using the discount rate (based on prevailing interest rates and risk) to calculate future revenue and profits in today’s value of money. For simplicity, NPV is not included in this example. The time span for calculating LCV should be based on your typical customer life cycle longevity. What analyses and insights can you glean from this Lifetime Customer Value example that would be beneficial to know in you business? The next post in this series reviews some of the insights that can be determined from LCV calculations. Buying Cycle – You have a customer – now what? This last post in the customer buying cycle series, explores opportunities for marketing and sales to engage with existing customers to drive more deals. Even though the customer has bought and successfully implemented your product/service/solution, the buying cycle continues with the customer focused on achieving the benefits and value that initially drove them through the earlier steps of the buying cycle. While a customer may not specifically be in the market to buy something at this time, the outcome from this phase of their buying cycle will determine whether they buy more from you in future and what recommendations they make to anyone who asks. It’s too early, no documented achievements yet – this gives marketing the opportunity to follow-up on a regular basis to monitor the situation. It’s not going well / we’re having problems / no case studies until our problems are resolved – although negative, marketing can help bring attention to the situation to get it resolved, and continue to follow-up and monitor. Customer agrees to do the case study as requested – confirmation of achievement you can now put on record and publicize to attract more customers. Also opens the opportunity to develop a mutually beneficial long term business relationship with the customer. It takes significant time, effort and resources for most B2B companies to acquire net new customers. But that’s just for the initial sale – it takes more time, effort and resources to unlock the much larger lifetime value of a customer. New customers – how to find and acquire net new customers – this is the lifeblood that feeds the long term viability of a business. Existing customers – how to develop customer loyalty that unlocks the significant lifetime revenue stream – this is the major source of revenues and profits for the long term. A key consideration from this series of posts is that the customer buying cycle begins long before your sales cycle and continues long after the sales cycle is done. How do your marketing strategy and sales cycle connect with your customer buying cycle? Talk to salespeople about their process to engage with prospective buyers and you’ll hear all about the sales methodology and sales life cycle they use. Marketing also has a life cycle for designing, developing, launching and executing campaigns plus another life cycle for managing, nurturing and distributing leads. These life cycles are all necessary and important. However, these are all inside-out processes on how you want to engage with prospective buyers or how they should engage with you. That’s an unrealistic perspective. Prospective buyers have their own buying life cycle that they will follow. Whether or not it’s a defined methodology, all B2B buyers will follow a similar process for acquiring whatever product/service/solution they need. Customers want to go through their buying life cycle processes and will buy when they are ready. You can achieve much better results by understanding and connecting with your prospective customer’s buying life cycle. I’m not suggesting you put the customer in the driver’s seat – sales still needs to manage and control the process, but to better align your marketing and sales processes with the buying cycle and the outside-in perspective. Sidelines – the vast majority of your prospective buyers are sitting on the sidelines, not actively looking to buy anything related to what you’re selling. Awareness – prospective buyers are aware of the general category or type of product/service/solution you are selling, but have not identified a need for it yet. Interest – the prospective buyer has identified a problem or opportunity that needs to be addressed and explores the issue in greater depth. Research – the prospective buyer defines their requirements and actively researches a long list of possible solutions for the identified problem or opportunity. Consideration – the prospective buyer finds suitable solution sources, gets more detailed information and does comparisons to compile a short list of possible solutions. Decision – the short list solutions are evaluated in various ways including customer defined demonstrations, tests, in-depth analysis and other methods to find the most suitable solution. The buyer could also decide not to buy anything. Marketing is usually disengaged at this point. Purchase – the purchase is made and everyone is happy for a fleeting moment. Sales usually disengage at this point. Implementing – the implementation process to get the solution installed and working for the customer in the manner they expect. Vendor or third party professional services usually assist customers with this step. Implemented – the solution is actively working for the customer. Vendor engagement with customers is primarily through support services from this point forward. Achievement – the customer (hopefully) begins to realize the benefits they set out to achieve from the solution. Loyal Customer – cultivating a satisfied and loyal customer has many benefits including additional purchases and referrals. Although some of these steps in the buying cycle may seem beyond the interests of a marketing and sales discussion, I’ve specifically included them because they are frequently overlooked opportunities for marketing and/or sales to be engaged. In the next several blog posts, I’ll delve into each step in more detail to explore how marketing and sales can engage more effectively and productively in the customer buying cycle to produce better results.